Sometimes dreams do come true. Cinderella gets to go to the ball….and a young Jewish woman from Winnipeg gets to travel around America, singing and dancing her way through that classic fairy tale story. From preschool through 12th grade, Alexandra attended Ramah Hebrew School, “the biggest Jewish School in Winnipeg,” a city of about 770,000. Her family attended a conservative synagogue. By the time it came time for her Bat Mitzvah, she was already well accustomed to performing in front of a large audience, having made her stage debut at age 4, with the Karpat Hungarian Dance Troupe (her father was born in Hungary). Her first musical was a production of “Oliver” at the Rady Jewish Community Center in Winnipeg. She played the title role. “I’ve been singing, acting and dancing all my life,” says the effervescent 26 year-old. “I’ve always been very petite, and though I studied at the Royal Winnipeg Ballet School from the age of 5, I knew that my body type would prevent me from becoming a ballerina.” Luckily, at the ballet school, she wasn’t limited to ballet; she also took tap, jazz and musical theater dance classes. “There was a really rich cultural community in Winnipeg,” she says by phone from Los Angeles, where “Cinderella” was staged before its San Diego performances (running at the Civic Theatre from May 5-10). Her father, a lawyer, and her mother, a Winnipeg-born judge, have always been supportive of her career choices. And those choices have paid off. Frohlinger has spent a good portion of her young life on tour with Broadway musical productions. First, she played the androgynous Anybodys for two years in the national tour of “West Side Story” (which took her to Japan, and also to San Diego in 2011). She made her On-Broadway debut in 2013 in “Soul Doctor,” which starred San Diegan Eric Anderson as Shlomo Carlebach (1925-1994), the Hasidic composer/teacher/performer known as “the singing Rabbi.” The charismatic holy man, who had performed with stars like Bob Dylan, Joni Mitchell and the Grateful Dead, used song and celebrity to spread the Torah to a broader, younger audience. Frohlinger obtained her B.F.A. at the Boston Conservatory of Music, which has, she says, “a stellar reputation for musical theater. I chose it because I thought I’d fit in there, and I could not have picked a better place for myself. “I’ve spent most of my 20s on tour,” she says. “And I love it! It’s a great way to see the country and meet lots of people. And this is the time for me to do it. Also, being in a show for a long time, it’s a great way to keep things fresh. Everything around the show is constantly changing, so you have to be on your toes all the time. Theater folks are known for becoming like family even in local productions, but when you’re on tour with the same group for years, that effect is heightened. She doesn’t get to see her family as often as she’d like. Holidays are particularly difficult; last month, Frohlinger was able to arrange a Passover celebration with relatives in L.A. Sometimes, her parents, and even her 90-year-old grandfather, take road trips to see her perform. Her sister, who’s attending college in North Carolina, joins Alexandra during school breaks. They were together in Philadelphia for Thanksgiving. When she returns to San Diego, which she adored, Frohlinger is looking forward to “hanging out in the Gaslamp, and running into that man with the parrot I kept seeing downtown!” The Zoo is on her repeat-visit list, too. And visiting a friend from high school, who lives near the beach. Looking back on her professional life thus far, Frohlinger notes that her first role of Oliver presaged her career arc. She performs in all the dance numbers in the show, as well as the all-female song, “What’s the Matter with the Man?” That song contains her favorite moment in the show. “It’s absolutely silly,” she admits. “We throw paper, but I pretend it’s glitter, and live my musical theater glitter-throwing dreams! The Rodgers and Hammerstein musical has had a long history, and a circuitous path to Broadway. It was originally written for television, and when Julie Andrews starred in 1957, the broadcast reportedly drew 100 million viewers. In 1965, the show was refashioned for tv again, with Lesley Ann Warren in the lead. The 1997 tv version featured the R&B singer Brandy. When the musical finally opened on Broadway, in 2013, it was called “Rodgers and Hammerstein’s Cinderella,” with a book rewrite and update by acclaimed playwright Douglas Carter Beane. The show retained most of the original score, including the lovely love song, “Do I Love You Because You’re Beautiful” (or are you beautiful because I love you? ).” Another romantic number is “Ten Minutes Ago.” There is, of course, Cinderella’s dreamy “In My Own Little Corner” and the charming “It’s Possible,” sung by the woman who starts out as a woodland beggar and turns into a Fairy Godmother. Other songs from the Rodgers and Hammerstein catalog have been added. The plot has been tweaked to conform with the modern conception of a Princess, who has to exhibit self-esteem and self-empowerment. This Cinderella is no victimized wallflower. She takes charge of her destiny. In fact, she doesn’t leave her famous glass slipper behind; she hands it to the Prince! This is, of course, The Year of Cinderella, what with the new Disney movie, starring “Downton Abbey’s” Lily James, directed by Kenneth Branagh. But the concomitance probably helps the touring production, which has gotten favorable reviews throughout its run. She has excellent chemistry with Andy Huntington Jones as Prince Topher, who isn’t a self-involved narcissist like the one in “Into the Woods.” He makes a self-discovery journey of his own, with Ella’s help. And many have praised the powerhouse voice of Kecia Lewis as the beggar/godmother. Still, it’s the magical makeover moment that has everyone electrified (“Miraculous!” crowed the Hollywood Reporter), a tribute to William Ivey Long’s stunning costumes. Of the show’s nine Tony Award nominations, costumes was the only winner. She’s kept working since she started out, and she’s never been forced to take a waitressing job. Frohlinger’s offstage activities include playing the ukulele (“a tiny girl playing a tiny guitar”), doing yoga, reading voraciously and listening to public radio. A lot of wisdom from such a diminutive young source. 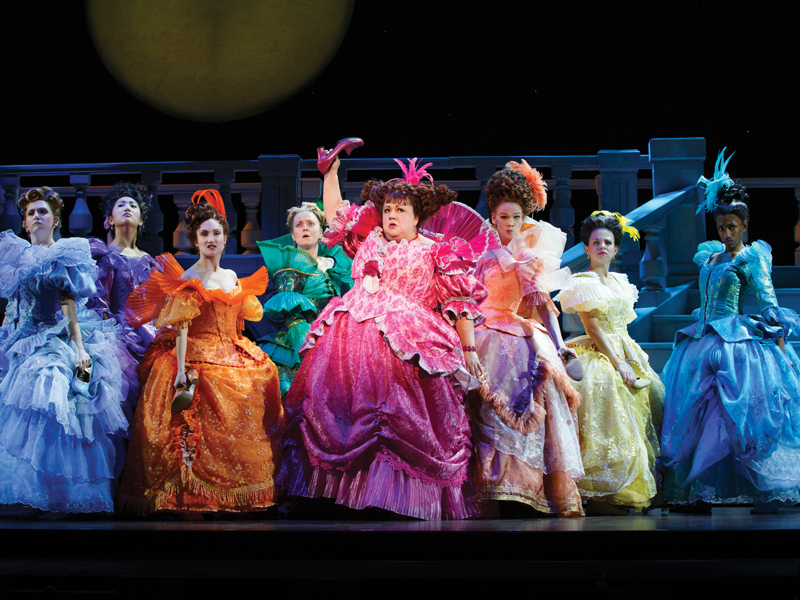 The first national tour of “Cinderella,” runs May 5-10, in the Civic Theatre downtown. Tickets ($30-$155) are available at 619-570-1100, or broadwaysd.com.